Art & Faith Matters: Is Today "The Day"? "The days are surely coming" we read in Jeremiah on Advent 1C (Jeremiah 33:1-4). And on "the day" no one will mistake it, according to Luke's gospel (Luke 21:25-36). There will be signs in the heavens, in the stars, in the moon. Luke's gospel says that when we hear of such cosmic events they should remind us that Jesus is returning. We should stand up and lift up our heads. Luca Signorelli depicted "the day", but his imagining of the events probably won't make anyone want to lift up their heads. Instead, stars fall from the sky and go pale; fires and earthquakes shake the earth. The painting is half of a lunette and doorway fresco titled Finimondo (the end of the world). 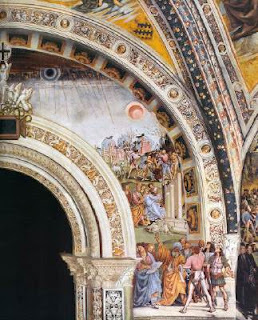 This is the right side of the door, and while the heavens fall apart at the top of the composition, at the bottom stand two witnesses to the event: King David (wearing a turban) and a sibyl (holding an open book). Luca Signorelli. Finimondo. 1499-1502. Chapel of San Brizio, Orvieto Cathedral. Orvieto, Italy. These two witnesses are mentioned in the "Dies Irae" (literally "day of wrath"), a Latin hymn written c. 13th century. The first verse says: The day of wrath, that day/Will dissolve the world in ashes/As foretold by David and the Sibyl. Sibyls (the Greek word sibylla means prophetess) were women of Greco-Roman origin who prophesied at sacred sites under the influence of a deity. This sibyl, it seems, wrote The Laetabundus (literally, Joy Abounding), the liturgical sequence that is part of the Mass for Christmas and Epiphany. These figures, two non-Christian figures interestingly, witness to "the day". The one that is surely coming. In every age people have seen signs in the heavens. They have seen wars and heard rumors of wars. They have remembered Jesus' words and know that it could happen at any time. Any day, any year could be the "the day" and "the year" of Jesus' return. Will the day catch us unexpectedly? Maybe this Advent is the time for us to stand up and lift up our heads. It could be at any time. 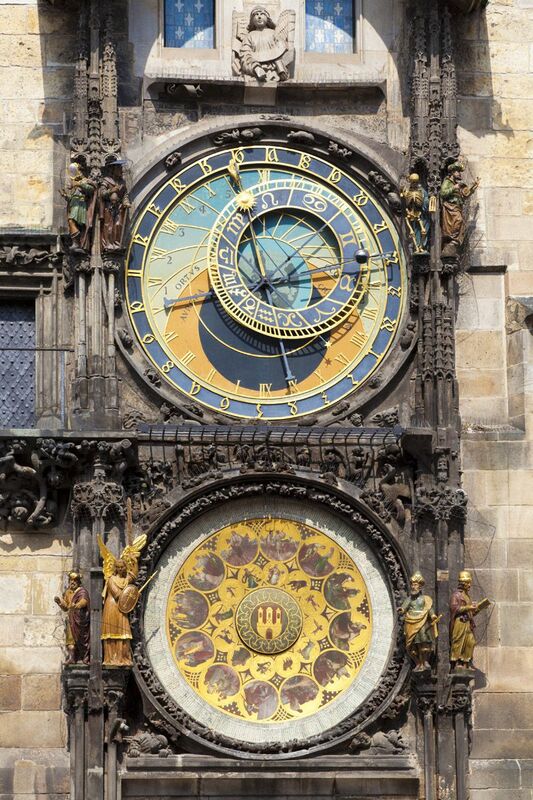 See how time and the signs of the sun, moon and stars, intersects in technology on the Art&Faith Matters Facebook page. For additional thoughts on Jeremiah 33:14-16, click here.